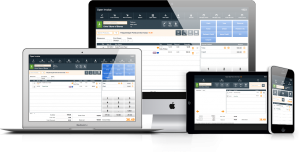 Unarguably the heart of your PayGo software, your Sale screen is designed to be quickly accessed, easily understood and above all, comprehensive and suited for any type of sale you’ll be making. 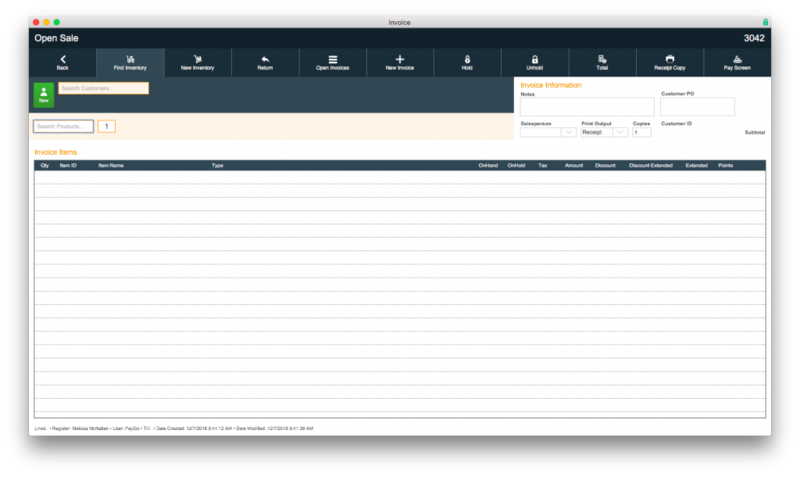 PayGo allows you to choose from several layouts for your sales screen, but for the purposes of this article we will be going over our most common workstation layout: the OneShot sales screen. If you’d like to skip directly to making a sale, see Making a Sale. To access your Sale screen, click the New Sale button on the top of your central Sales screen. At the top left side of your screen, you can see the current sale’s status – for instance, whether a sale is an Open Sale, OnHold, Completed, and so on. At the top right corner of your Sale screen, you will see the sale’s automatically generated Sale ID (or Invoice ID) number. Along the top of the screen, you’ll see several buttons. Back: This button will exit you out of the Sale screen and take you back to your central Sale screen. Note: This does not close or delete the sale, even if you have not entered any information into the screen. You can access this sale later by clicking the Open Sales button. Find Inventory: Clicking this button will open the Inventory Search screen. When a search has been perform and the item you wish to add to the sale is located, you can add it by clicking the Plus button to the left of the item’s name. New Inventory: This button will allow you to add a new inventory item to your PayGo software via the Inventory Quick Add screen. Return: This will initiate a customer return. When the button is clicked, you will be taken to the Returns screen, where you can enter the Sale ID number for the item the customer is returning. Open Sales: Clicking this will open the Invoice List for open sales. You can open the invoice for any open sale by clicking the Arrow button to the left of each Sale ID number. New Sale: Clicking this button will open a new Sale screen. Your current sale will remain open in its own separate window. Hold and Unhold: These buttons will respectively hold and unhold the transaction. You can determine whether a sale is on hold or not by the invoice status at the top left side of the screen. 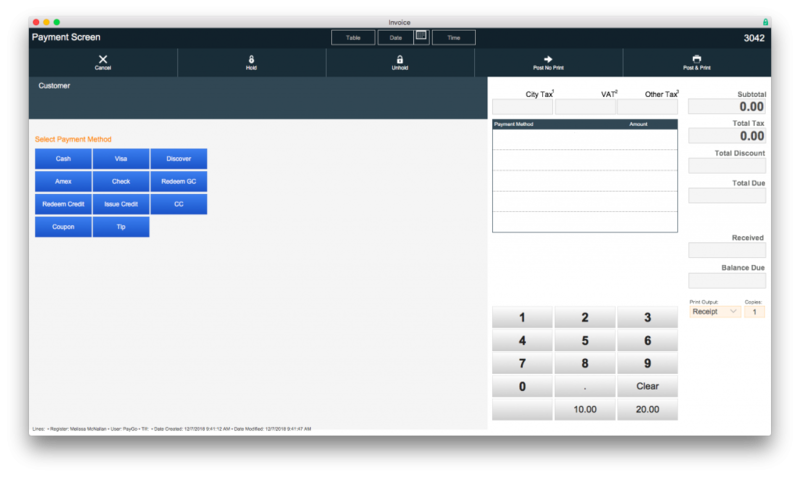 Receipt Check: This button will print a check-style receipt for cafés and restaurants. Receipt Copy: This button will print a copy of the sale’s receipt. Post No Print: This button will post the current transaction without printing a receipt. Post & Print: This button will post the current transaction and print a receipt. Just below the buttons, you’ll see the fields for adding a customer to the sale. You can search for customers already in your database in the Search Customers field, or you can add a new customer by clicking the New button to the left of the Search Customers field. When a customer has been selected, you will be able to see their customer loyalty status, sales history, view and add any credits they’ve earned in your stores, or edit their profile information. To remove a customer from the sale, click the Remove button. 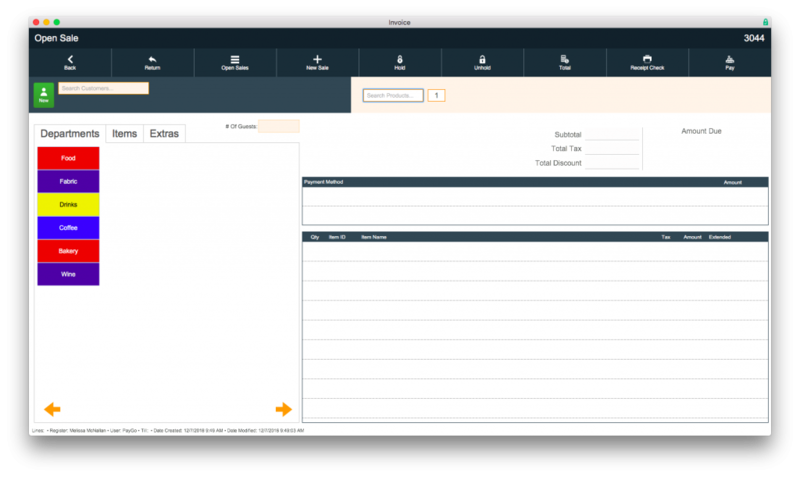 Below the customer fields, you can set the salesperson and print output and number of copies for the sale receipt, and add products to the sale. In the Search Products field, you can add products by either scanning the item’s UPC, adding in the item’s ID, or search your inventory for products to add. You can change the quantity of the item in the field to the right of the Search Products bar. Items added to the sale will appear in the Item box below. Items in this box are organized by Qty (quantity) which can be changed in each line item as applicable, Item ID, Item Name, Tax type, Amount, any applicable Discount, and the Extended amount. Items can be deleted by clicking the Trash icon to the right of each line item. If you need add a total discount or change tax rates for multiple items, you can select items to change by checking the box to the end of each item. When selected, buttons will appear above for changing the tax rates, adding discounts, or deleting the items. You can also click the Select button to select or deselect all items. Clicking the Tax button will prompt a pop-up box allowing you to select tax defaults for the sale, use a specific predefined tax profile, or change the city, state or other tax. Clicking the Disc (discount) button will prompt a pop-up box allowing you to select any predefined discounts for the sale, or add a discount number or percentage manually. Below the Item box, you’ll see totals for the sale. This includes the number of items on the sale, the sale’s Subtotal, Total Tax, Total Discount and Sales Total. The amount Received will be added when payment is entered for the sale. To the right of the Item box, you’ll see payment buttons. The payment types can be edited in PayGo’s Admin Central screen, and include cash, check, credit cards, coupons, gift cards and/or store credit. Payments applied to the sale will show in the Payment box below the buttons, sorted by payment type and amount. Below that, you will see a keypad for manually entering payment amounts. 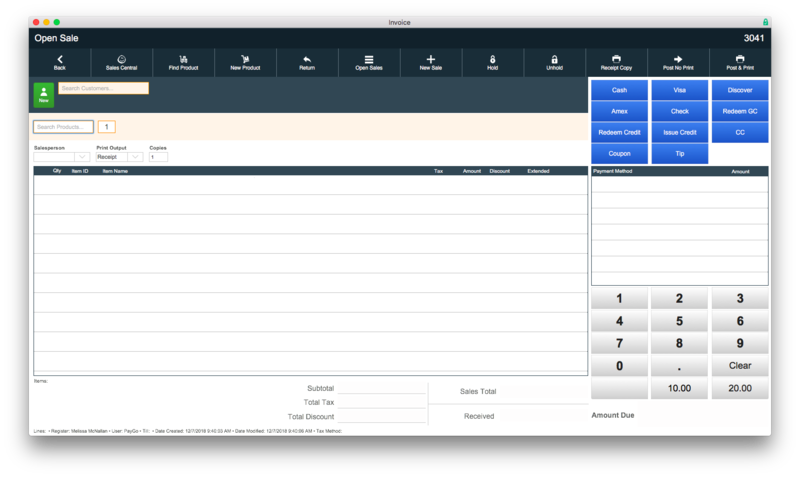 Finally, at the bottom right of the screen, the customer’s Amount Due will be shown.